The addition of Learning to a Deming-like cycle may help integrate KM and continual improvement. The Deming cycle is at the heart of continuous improvement. Based on 4 steps of "Plan-Do-Check-Act" (PDCA) it is a cycle of action, or a cycle of mindfulness, that drives and continuous improvement. Learning is implicit in PDCA, but not explicit. It is assumed that through this cycle, practices and products are continuously improved, and that the organisation thereby "learns" to improve. The Acting as a result of Checking should involve a learning step - we learn from the results of the check, and decide which action to take. The planning should be based on Learning from others. However as Knowledge managers, we know that you cannot assume learning will take place naturally, and that there is value in making learning steps explicit lest they be skipped. There is a variant of PDCA which makes the learning step explicit. 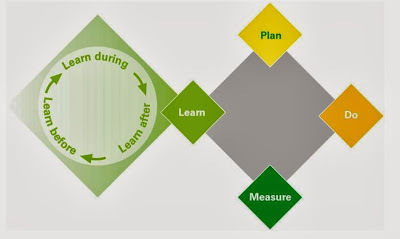 This is the "Plan-Do-Measure-Learn" cycle (PDML). You plan your work, you do your work, you measure the results, and you learn from them; making appropriate improvements as a result (improvements to practice, product, behaviours, structures etc). The picture above is taken from the 2006 publication, "Implementing a Framework for Knowledge Management", written by me, Peter Gibby, Walt Palen, and Sarah Hensley. It shows how Knowledge Management is an expansion of the "Learn" component of the PDML cycle. In fact, it is hard to see how you can operate the PDML cycle as an organisation, without KM. Here we break out the KM element into "Learning Before, During and After" - that well-known basic model of activity focused KM. The link here between the PDML cycle and the "Learning Before, During and After" cycle emphasises three things. Learning comes before planning. Although the PDML cycle is usually described as "Plan-Do-Measure-Learn", it can equally well be described as "Learn-Plan-Do-Measure." In fact, "Learn-Plan-Do-Measure" is a great way to look at the cycle, because, to be honest, all planning should be based on learning.